The most consistent performer of the past three decades on the heaviest stretch of surf in the world happens to be one of the smallest. At a mere 5'5" and 135 pounds, Michael Ho personally proved size to be of little importance when it comes to bravery on the North Shore. 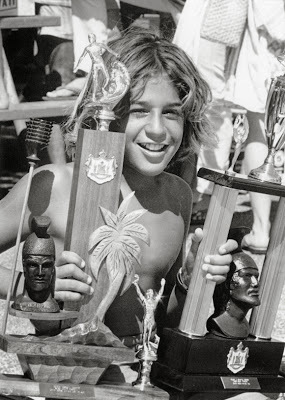 His expertise was not limited to big surf, as he became a highly successful and feared competitor in all conditions, finishing in the ASP Top 16 for 10 consecutive seasons. Coco and Mason continue to carry the mantle well. You can read the rest of Michael's write-up on Surfline HERE. This photo is from the Clarence Maki Collection and was taken July 16, 1972, Michael had just won the Waikiki Junior Surfing Championships, a mere 3 days after his fourteenth birthday. A side note, Don Ho, the famous Hawaiian crooner is Michael and Derek's cousin.